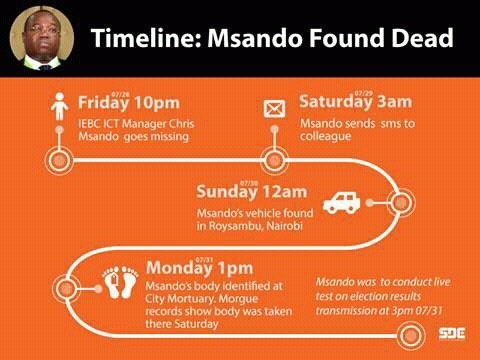 On Friday, July 28, after an interview at a local television studio, Independent Electoral and Boundaries Commission ICT Acting Director, Chris Msando was reported missing by his wife. He was among a handful of IEBC ICT managers who knew where the poll body’s servers were and was scheduled to demonstrate a dry run on Monday, July 31, on how the relaying of results would be done after the election was held on August 8. According to prior to reports, his wife reported to the Embakasi police station that she’d not heard from her husband, a situation which had the poll body issuing official statements on social media that they were working with police to locate Msando. His last apparent communication was at 3 am on Saturday, July 29, to one of his colleagues reminding them of their schedule for the next day. Since then, he has not been heard from. That was until vocal Jubilee Member of Parliament for Gatundu South, Moses Kuria, emerged with claims that he’d located the missing director to a woman’s home in house off Thika Road. spotted on Mombasa road after Msando left the KTN studios. “Gentlemen, ukibeba (if you carry a) female passenger usijaribu kupotea (Don’t try to disappear). Kuna (There is)CCTV Mombasa road na kwingineko (and other places). An IEBC staff has gone missing and the first 411 is he was seen at 2.30am with a female passenger down Mombasa Road. Imagine what a lot of people are thinking. I hope he’s safe,” updated a social media user. Earlier than Moses Kuria, at around 2 am, Monday, July 31, as well, another woman took to social media with an update of the sighting of Msando’s vehicle parked in a compound. Investigations into his whereabouts are still ongoing and police, as well as neither IEBC nor his wife, are yet to confirm his whereabouts; or whether he is alive. “.. I told you this guy was already in Canaan,” wrote neuro_words. “So the National Tallying centre has been transferred from Bomas to Roysambu. Isokey,”wrote @ElijahMutua_.